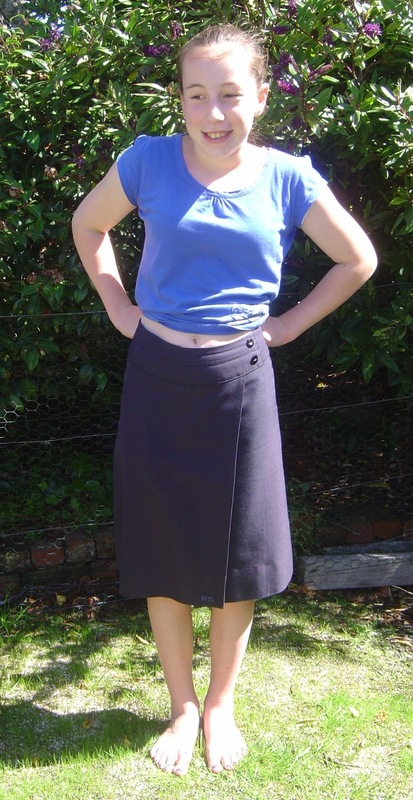 Everything Just Sew: The Worst School Uniform Skirt Design In The World. 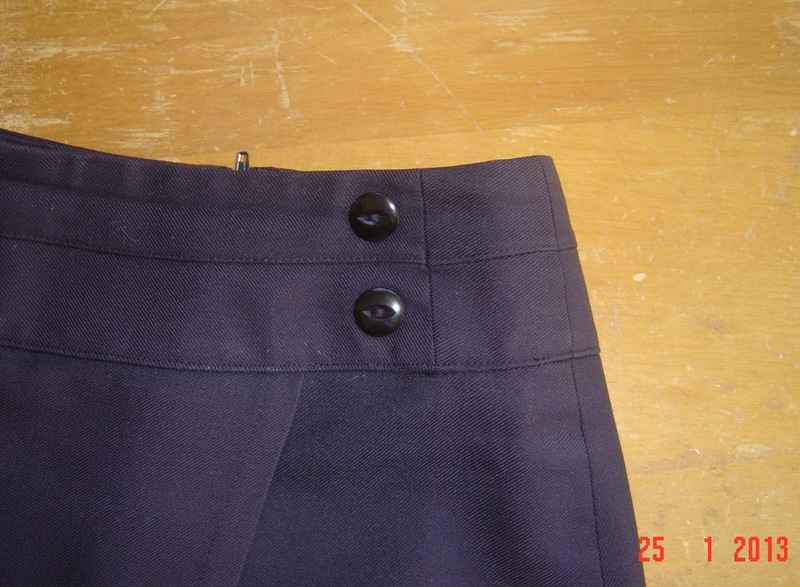 The Worst School Uniform Skirt Design In The World. Georgia is off to High School this year. Her school changed its uniform two years ago, (so Cayden wasn't affected, thank goodness) which I dislike intensely. It is (considerably) more expensive, and way less durable and practical. And instead of one uniform for four years (with boys switching to long pants for the latter two) and mufti in their final year, it has become a whole different uniform for juniors and seniors. I hated it as soon as I heard about it, and then I got my hands on it. We were incredibly fortunate to be able to buy a second hand uniform (given how recently it was introduced, there aren't many around!) which saved around $300. Not the size I would have bought for Georgia if I bought new, but once again I thank my lucky stars that not only can I sew, but I can sew WELL. 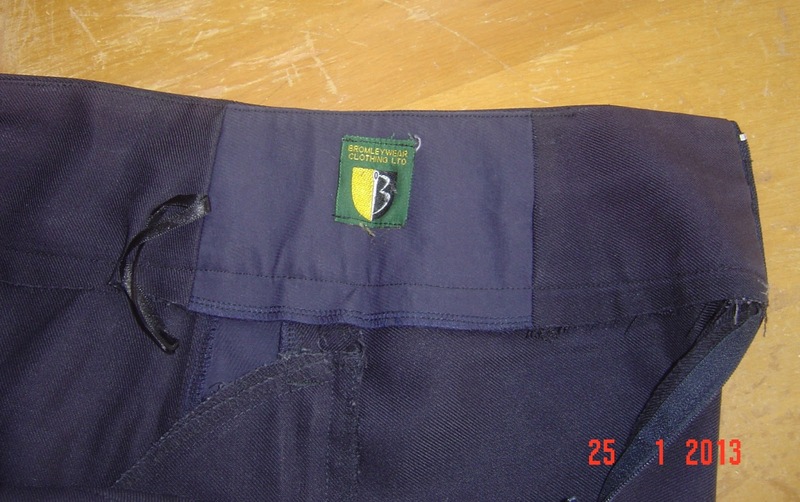 Here is her skirt (after I've operated on it). Nice isn't it? No, it isn't. I swear whoever designed this item sat down one day and tried to think up ways to make it as unalterable as possible. For girls who are 13-15 years old. Right when most of them grow. It is a faux wrap with the free hanging panel caught in the right side seam, topped off with a yoke. There is no easy way to make reversible changes to the skirt - you can't buy one a bit too big and take it in and up till she grows. If she does and you don't want to spend another $90 on a skirt for the last term of her junior years, you can't let it out or let down the hem. Unless you are me, and prepared to spend the multiple hours required to do so, providing of course that you have at least my level of experience and know how to do it! No false modesty here folks - I know my way around alterations. Attractive yoke isn't it? Shame it is invisible under the shirt designed to always be worn untucked. 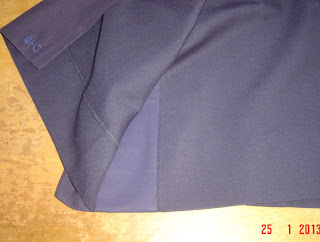 This is how the right side seam looks now. The little patch in the yoke was harvested from the inside. 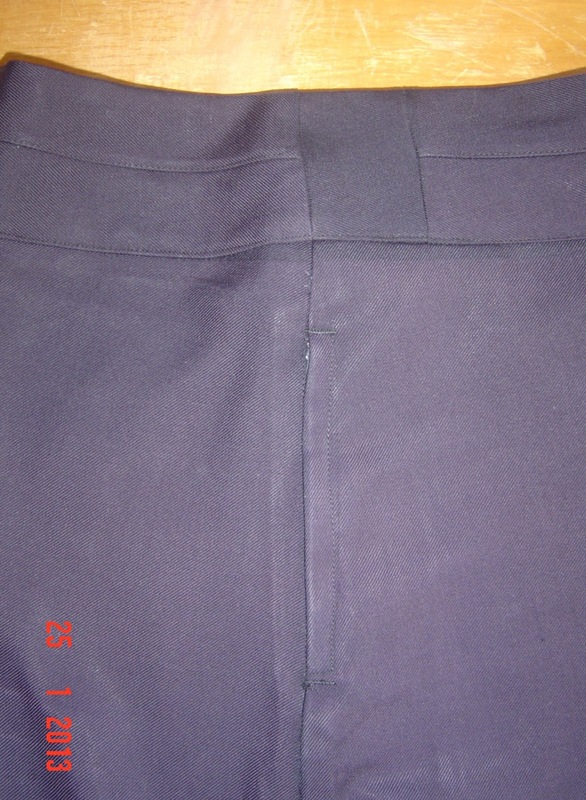 Incidentally, the inseam zipped pocket in the only possible seam which could be altered didn't make it any easier. I replaced the harvested bit inside the yoke with this patch. Nobody can see it, it'll do. You can just see the top of my added side panel under it. 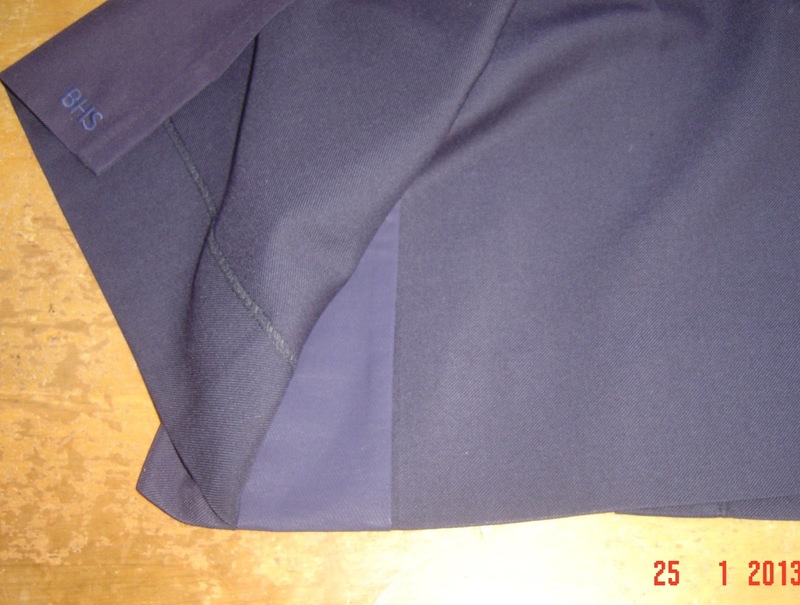 To make the skirt bigger I snuck an extra panel of close-enough navy fabric under the flap, where you can't see it. By the way - do you see the embroidered logo on the corner of the flap? Yeah, it's stitched through the sewn hem, so you can't adjust the hem either. 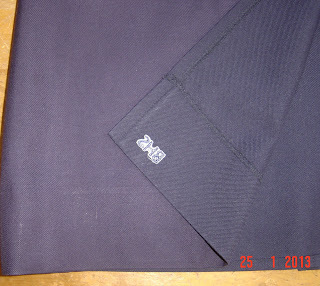 I have never ever seen a school uniform design as flawed as this. The girl who owned it before Georgia had clearly grown during the two years she had worn it (as one would expect of a girl her age), and the skirt lining has pulled so badly at the seams that it is unsalveageable. The ONLY thing this skirt has in its favour is that the lining is sewn on as an afterthought to the yoke. It was easy to remove, and will be easy to replace. This skirt annoys me for so many reasons - it is so difficult to alter that for the vast majority of Mums (let's face it, it's mostly mums who repair and hem uniforms, if anyone does)that it would be well beyond their capabilities, and because what can be done is so time consuming it would be prohibitively expensive to pay someone to do it. So, you pay $90 for a skirt when your daughter is 13 and highly likely to grow, making it very possible that it won't fit her for the two years she needs it. And pretty much your only option is to fork out another $90. Since I don't like non-constructive criticism, I put a fair bit of thought into how this design could be improved. (It is a lovely skirt, just wildly inappropriate for its intended use.) Giving the left side seams wide allowances would be a huge improvement - the skirt could be taken in or let out there relatively simply. Not embroidering the logo through the stitched up hem would also be good - then the hem could be adjusted! I still wouldn't like it much, but those minor changes would make a vast difference to the longevity of the skirt. Rant over. Phew, I really needed to get that off my chest. Holy moly it's a nice style if you are making it for work but I agree with all of what you say. Whoever designed it is showcasing their own skills but not actually understanding the brief...but I don't have to tell you that really do I? Well, clearly they have bought a "blank" and then embroidered it. So, can you make up your own pattern for it so you don't have to buy another one? 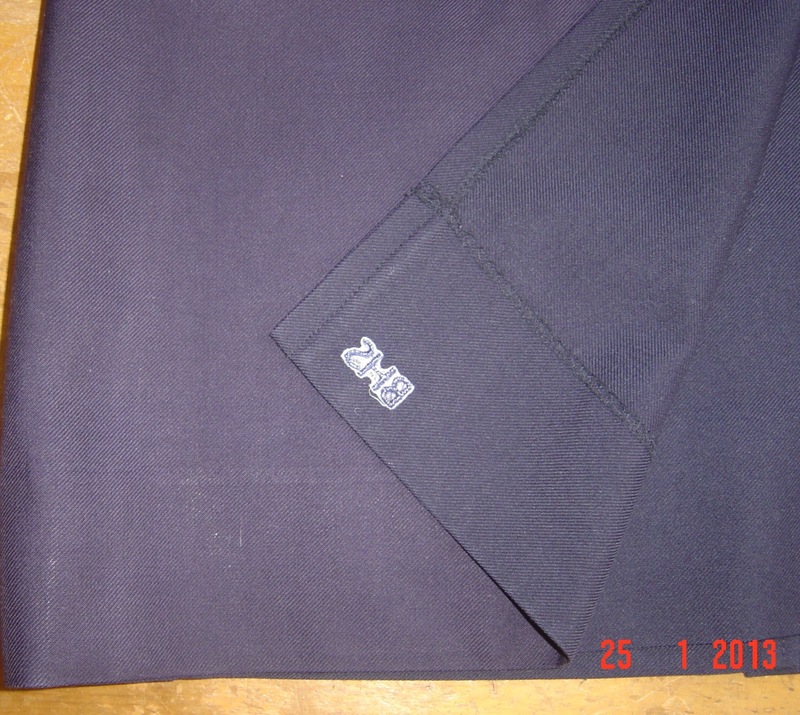 Seeing as they don't see the yoke, could you get a (better designed)navy skirt from one of the other schools and use M's embroidery machine to BHS it?